Kerala is one of India's most popular tourist destinations, and was declared by the National Geographic Traveler magazine as one of the "ten paradises of the world" and "50 places of a lifetime." Kerala is a very unusual state, with its relatively high proportion of Christians (19%), high level of education, and (nominally) Marxist government. At present, the Left Democratic Front (LDF), led by the Communist Party of India (Marxist) (CPI(M)), heads the ruling coalition. Probably because of this, while Kerala has India's highest Human Development Index rating, economic growth has been disappointing (a phenomenon known as the "Kerala model of development"). After 1990 there was economic liberalization, resulting in higher growth. However, Kerala's economy depends on emigrant workers, mainly to the Gulf. Remittances contribute more than a fifth of GSDP. Kerala's government is India's least corrupt. The average life span of its residents is almost as long as Americans and Europeans. Kerala has a low infant mortality rate, one of the world's highest literacy rates, and a birthrate lower than the US's, and decreasing faster. Both rural and urban poverty rates are exceptionally low. Kerala has a matrilineal tradition, making women here more respected than in most parts of India. The population density is very high. Kerala's people speak Malayalam, and the culture is a mix of Tamil and southern coastal Karnataka. Performing arts include koodiyattom (a 2000 year old Sanskrit theatre tradition). Kerala's traditional music is distinctive, including raga-based renditions known as sopanam accompanying kathakali performances. Popular attractions include the beaches at Kovalam, Cherai and Varkala; the hill stations; and national parks and wildlife sanctuaries at Periyar and Eravikulam National Park, which have elephants. The "backwaters" region, an extensive network of interlocking rivers, lakes, and canals that centre, also sees heavy tourist traffic. Kerala has its share of heritage sites, such as Padmanabhapuram and the Mattancherry Palaces. In the east of Kerala there are rugged mountains, in the west, coastal plains. Kerala has a humid tropical climate. b winds and rainstorms are common in summer. The food is spicy and much of it is vegetarian, but beef is a favourite, unlike in most of India. Nicknamed - the land of coconuts, Kerala features coconut paste and oil in many dishes. The city of Kochi and the state capital Thiruvananthapuram are two cities that offer traditional dramas and plenty of shopping as well. Thrissur (Trichur), known as the city of culture, is home to various Hindu temples, churches, and India's first mosque. The capital Trivandrum (Thiruvananthapuram), the "Evergreen city of India," as Mahatma Gandhi called it, is close to the sea and set among rolling hills. 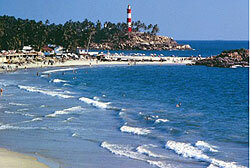 As the state capital of Kerala, it is home to many government offices and a bustling commercial area. It hosts the University of Kerala and other major educational institutions. The city is vibrant during the festival season in August and September.